It ended with a meeting of the Paul Morris Memorial Prize panel to start the process of selecting the 2011 winner. 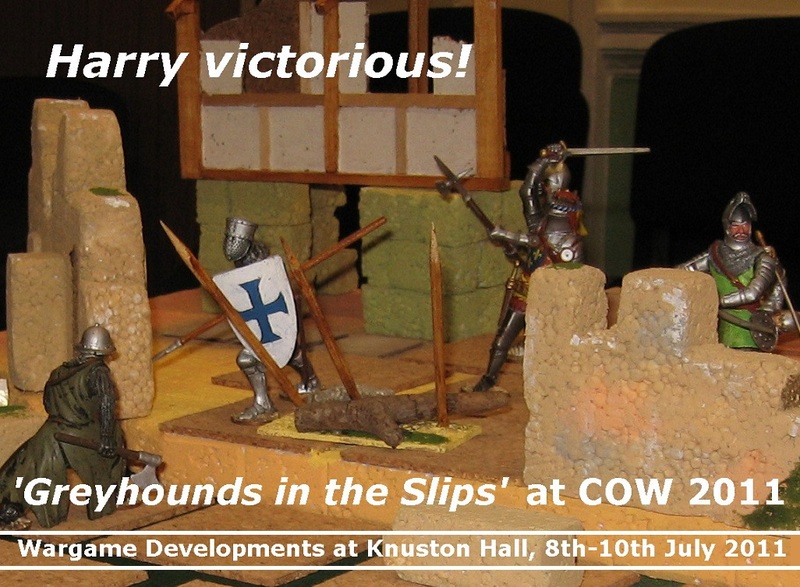 The prize is sponsored by John Curry's history of wargaming (and, in addition to other benefits, the winner will be entitled to choose a book from John's increasing stable of classic titles). At present, the panel consists of myself, John and John Bassett O.B.E. (the 2010 winner). We are happy to add other enthusiasts to the team, and are keen to look at nominees for the award. 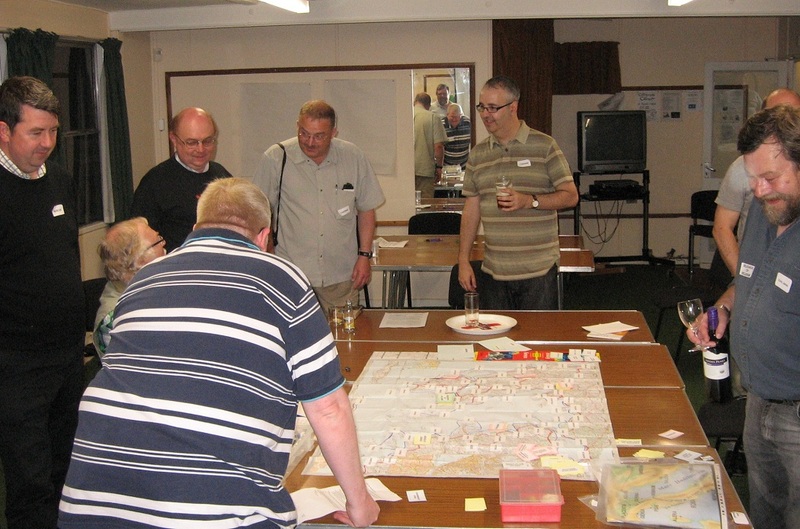 The Paul Morris Prize is awarded to the most innovative non-commercial wargame within the Society's remit. 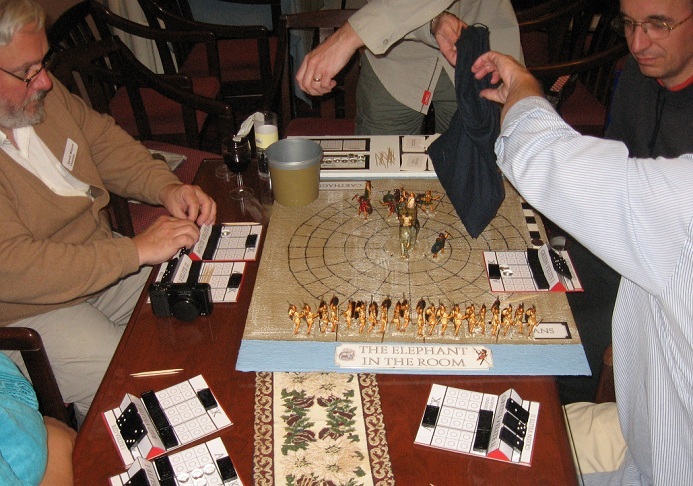 In practice, the game needs to have been presented in a public forum (at a show or event, published in the Internet or similar), but not sold in a fully commercial package. The panel is able to consider reports on games that correspondents have seen in play or played, it is not able to consider games submitted by authors in the expectation that we set them up and evaluate them ourselves (though when we have a short list we will endeavour to see the games in action where we can ...).. Please contact any of the panel if you wish to join us or if you have a game you wish to nominate. John Bassett's Caesar's Heirs was a fast paced multi format romp through the civil war following Caesar's assassination. I took the role of Mark Antony and immediately set about consolidating my support and hoping to see the decline of my two great rivals ... Octavian (my rival on my own side) and Brutus (the murderous republican) .. as luck would have it both were killed in a great battle which the Triumvirate won, leaving me the greater power in the land. It was delightful to see the Republican players gobbling up the power and offices we were able to scatter on the table as the fruits of victory ... Rome indeed is a great she-wolf at her best nursing her little ones. At game end, only Cimber was left ... isolated but powerful, still holding true to his old-fashioned values, and with a significant force at his disposal. 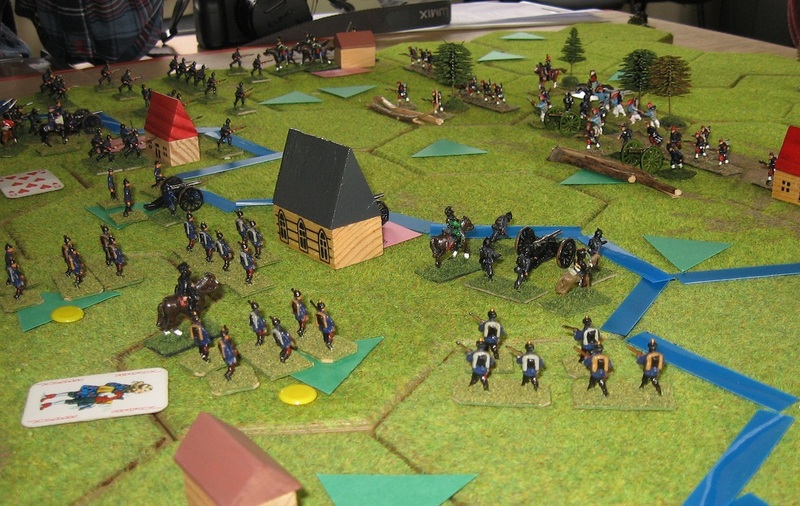 However, the grain was now flowing, and Cimber's army though vast comprised more allies and auxiliaries, less the veteran legions that would dominate a coming battle. He would surely be hunted down. After dinner both evenings saw the Society's Domino Double Header games out and offering lively entertainment. In one of the hard actions at Harfleur, Henry got himself surrounded. 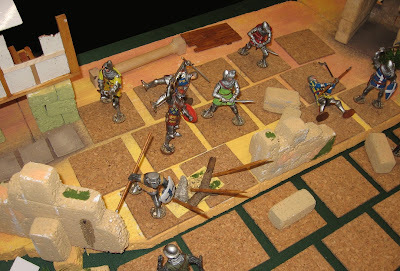 Having bloodied the Captain of the Guard almost to the point of defeat, he confronted a critical decision: one high-powered domino available amongst a handful of low numbers - should this go to the attack and finish the action? Or should he, more sensibly, make sure his defence was adequate as victory looked assured whatever? 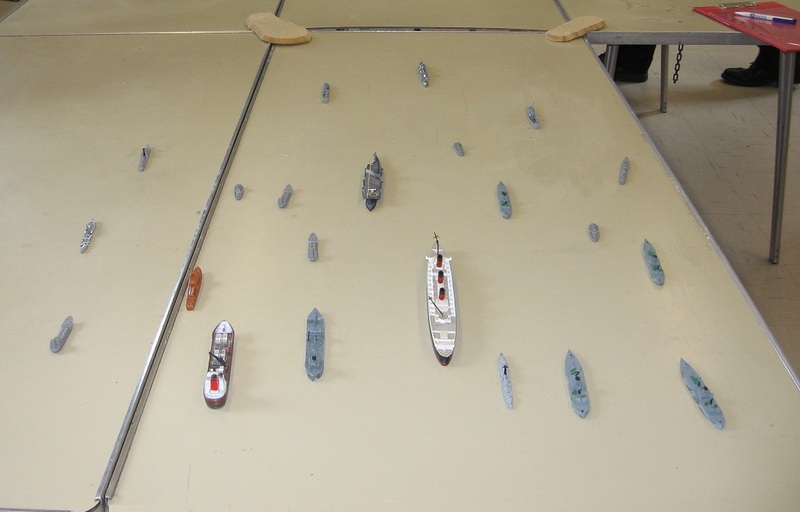 He went for the attack, the Captain just survived and so was able to make the counter. The random counter attack domino was deadly and Henry went down in the breach. There would be no Agincourt - the campaign would end in failure on the muddy coast of France. You can get a copy of Domino Double Header from the website ... or from us at a show (next outing ... Claymore, of course) ... You will need access to 2 to 4 sets of dominoes. 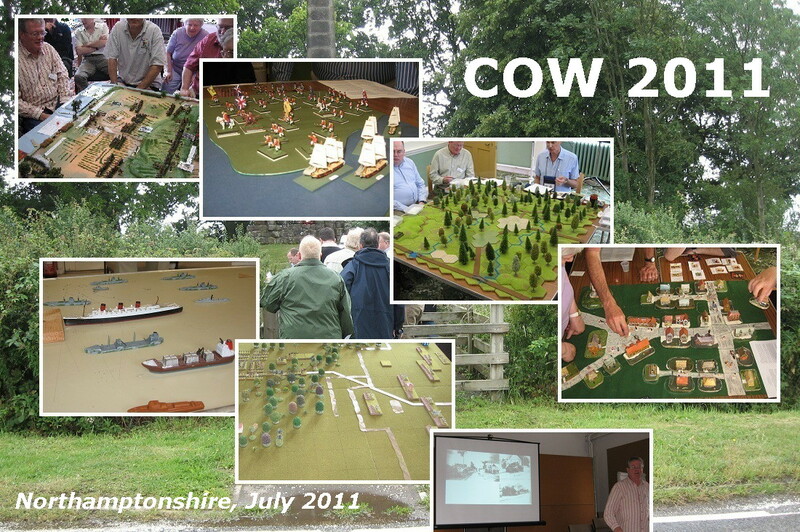 For more on the twentieth century COW content, have a look at my P.B.Eye-Candy blog ..
As I've mentioned in the past, COW is also often my only opportunity of the year to sit down with the Society's Life Vice President Phil Barker and chat about relevant topics. 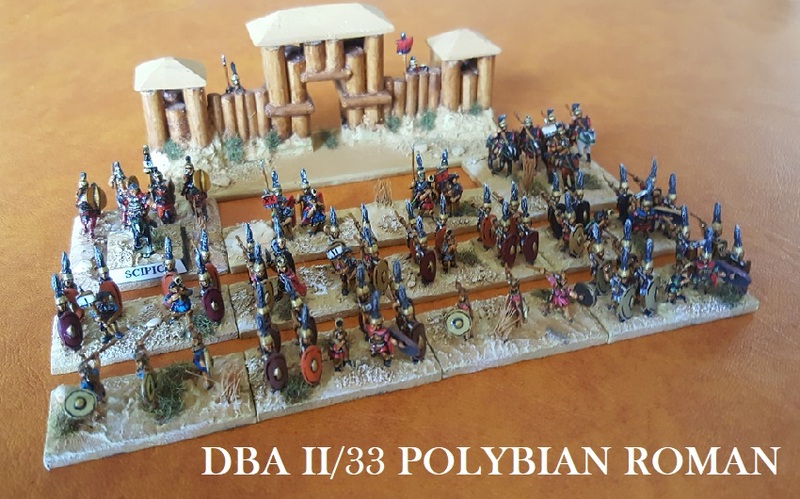 We had a good look at some of the burning topics (DBA v3 and such like), and some valuable reminiscences about the early days of ancients gaming. 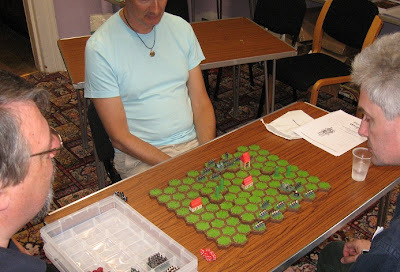 Re DBA 3, I can only pass on Phil's general advice (don't judge it in advance, on the basis of rumours about some isolated changes ... judge the whole game that has resulted extensive input and testing). 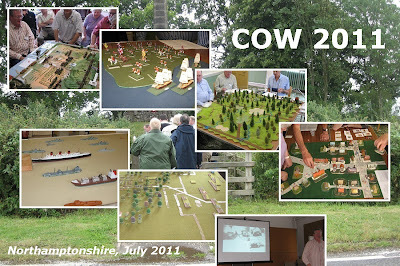 COW forms part of a very intensive early July. Campaign took place on the same weekend (so I await reports ... ), meanwhile, I am writing this a week later - already after English Heritage's Festival of History at Kelmarsh Hall. Some perspective on that event will have to wait for another session (and another batch of photos).